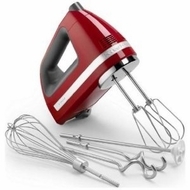 This hand mixer has a comfortable soft grip handle for extended mixing, whipping and kneading. nine speed electronic control with digital led display makes the tasks so easy. You can go from slow stir with soft start feature to high whip-with the touch of a finger. comes with whisk to get perfect egg whites into fluffy peaks. Knead yeast though effortlessly. Mix ingredients for your favorite desserts. The sleek, speedy KitchenAid Architect hand mixer puts professional power in the palm of your hand. Simple fingertip controls let you switch between nine speeds with ease, while a soft start function increases speed slowly to prevent splattering. A soft grip with ergonomic finger groove keeps your arm fresh, letting you mix more without any discomfort. Model KHM920 * Efficient, lightweight DC motor delivers more power while using less electricity * Digital control with led display allows you to easily see and adjust the nine speeds-including soft start feature for delicate mixtures-with a touch of a finger. * Stainless steel turbo beaters and stainless liquid blender rod * Easy beater eject button * Locking swivel cord locks to the right or left to avoid your mixing path * No-tip heel rest; non-clogging air vents.